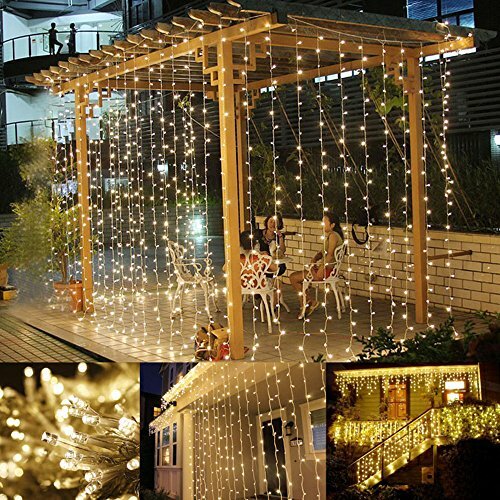 306 LEDs Fairy String Light: 306 Super Bright LEDs, gives off soft warm white to creat a warm and wonderful astomphere; When Spread out the light, it has 18 strings and each string included 17 pcs light beads in it, and with the 360 degree viewing angle make the light illuminate in every direction. 8 Modes Setting: The controller has 8 different light patterns: Combination, In Waves, Sequential, Slo-glo, Chasing/Flash, Slow Fade, Twinkle/Flash, and Steady On. Different lighting effects are controlled by only one button, and he controller has memory function, which could recover from the previous setting mode when you restart. Safe to Use : UL Certificated Output and wire operating with 29V DC voltage, leads to 29V safe output by UL plug-in transformer. It has excellent heat dissipation and is safe to touch. Widely Use: 9.8ft*9.8ft window string light is very flexible to use, fits for the 3m(9.8ft)long windows, It also can be hung on Walls, Doors,Eaves, Ceilings, Balcony, Corridors and other places, which can bring the warm and sweet atmosphere to your house, but remember to keep away from the rain. What Will You Get: One set LE 9.8*9.8ft 306 led curtain lights, 1 pcs controller box, 1 pcs easy to read manual, 12-month warranty and our friendly, easy-to-reach customer service.